The construction industry’s challenges are no secret — rising construction materials costs, a skilled labor shortage and overall lack of productivity improvements are driving up costs and extending timelines for many projects. Now Construction Technology (ConTech) companies are stepping up to address these challenges using digital solutions, with the goal of disrupting the industry for the better. Realizing the extent of this wide-open opportunity, Silicon Valley investors are pouring unprecedented levels of venture capital into funding ConTech startups. Venture capitalists invested $1.65 billion in ConTech-focused startups in 2017, more than double the $665 million invested in 2016, according to JLL’s recent report, “The State of Construction Technology.” The first six months of 2018 also saw an investment volume of $1.05 billion, a record high for the first half of the year. This huge bump in capital investment provides hopeful proof that the tide is turning for the construction industry and that technology can begin effectively addressing its existing challenges. Many of today’s construction projects are still managed by paper and pen — an outdated approach that directly limits productivity. While productivity has doubled in almost every industry over the last 25 years, thanks in part to technological advances, it has flattened out and even declined in some cases in construction. By infusing the sector with software, technology and computing power, tech startups are aiming to turn those productivity numbers around. And improving productivity can go a long way toward helping construction companies overcome other industry challenges, including expensive building costs and a widespread labor shortage. Construction materials costs have been growing increasingly. From Q1 2017 to Q1 2018, costs rose 5.6 percent, and another 5-6 percent step-up is expected by Q1 2019. Tech tools that improve productivity and efficiency can help offset these high costs, which makes them attractive to investors looking for promising new projects to fund. Efficiency-enhancing tech solutions can help address another challenge, too; the number of construction workers is down 12.9 percent from 2007, while wages have jumped 31.2 percent in the same time frame. There may be fewer skilled construction workers to fill jobs, but that doesn’t mean there’s less work to be done. Our growing population still needs more places to live, work and play. Technology offers infinite potential for the construction industry to meet that demand even in the face of rising material costs and labor shortages. Despite these industry-wide challenges, construction spending is still on the rise, up 23.3 percent from 2007. We expect it to hit $1.3 billion in 2018 as construction firms continue to experience healthy demand. Now, they can begin to access more promising and efficient ways to fulfill their businesses. 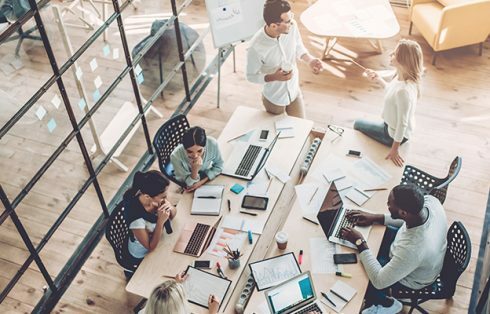 Collaboration Software: Considering that dozens of people often work on the same construction project at the same time, leveraging cloud-based software could profoundly improve collaboration and impact the bottom line. Startup leaders on this job, like Procore Technologies and PlanGrid, are offering ways to drive efficiency and accuracy by enabling project teams to share plans and markups in real time. Off-site Construction: Faster assembly and more centralized production can help offset the labor pinch and rising costs. So startups like Katerra and Blu Homes are fabricating building components in a manufacturing setting, which can then be sent to the site for faster, more economically constructed buildings of almost any property type. Big Data and Artificial Intelligence: From materials delivery to equipment management, predictive data and automation tools can bring together data on nearly every aspect of a construction project. Armed with data-driven insights, construction teams can save time and money up front, while extending the life of expensive equipment and making better informed business decisions. Major startups attracting investor interest in this space include Uptake Technologies and HELIX. These and other promising new innovations spell continued momentum for construction technology in 2018 and beyond. And as more tech and hardware ventures enter the startup space and eventually the marketplace, it’s likely the construction solutions will continue pouring in, too, at least for the foreseeable future.